Get Supernatural on TV Guide! How awesome was "Weekend at Bobby's"? Jensen got a lot of attention for his (IMO, stellar) direction of that episode. In case you missed it, scroll down for an awesome behind-the-scenes. There's a spoiler somewhere in here that I didn't read. Bela/Lauren Cohen fans might be interested to learn that the actress is coming to Vampire Diaries soon. "You don't want know when I'm going to be in it or not be in it," he says. "You just kind of want to know that I exist. The fans are very, very serious about not getting spoilered on this. So let's hope that you guys keep quiet. You shouldn't even mention that I'm here." Of course, Firefly fans knew of his awesomeness years ago, m'iright? :) He goes on to discuss his future on the show (without spoilers) and Jensen's directing. Extra TV at Warner Bros. Photos I will not look at. Zap2it article I did not read. Due to my son's birthday party (and the ensuing cleanup) I didn't get to watch "Weekend at Bobby's" until this morning. In order to get you the recap (so, obviously, SPOILERS) sooner, I tried to watch the episode last night and fell asleep shortly after someone was fed through a wood chipper...which, as you might guess, does not lead to sweet dreams. In fact, we see Mark right at the beginning of the show, flashing back a year (right after Sam sacrificed himself to save the world) when Bobby tries to get Crowley to uphold his end of the bargain and give back the soul that Bobby didn't so much sell as "pawn" (gaining in the deal use of his paralyzed legs). But it turns out that Crowley isn't giving it back (shocking, isn't it? A demon who can't be trusted!) Crowley, with the help of a hell hound, ends the encounter with the upper hand but we know that Bobby isn't going to stop trying. We normally see the boys' interactions with Bobby through their end--with Bobby often being the voice on the other end of the phone, dispensing wisdom and occasionally humorous insults. This time, we stay with Bobby and see what his life is like after he hangs up the phone. In this case, that life includes torturing a crossroads demon to get information on Crowley. When he has what he wants (Crowley's original human name), Bobby kills her, by pouring the mysterious contents of a bag into a fire. But prior to that, she offers up the information that Crowley isn't just the king of the crossroads, he's the king of hell. So is he the new big bad now that Lucifer's in the box? While I don't want a rehash of last year's angels v. demons, I would be totally okay with more guest appearances by Sheppard! Meanwhile, we see another aspect of Bobby's life--the chipper blonde neighbor of six months who's still trying to get to know the single man who lives next door. She brings him a ginger peach cobbler. And now that I've finished typing that sentence, I realize that use of the word chipper may have been a Freudian segue. When Bobby attributes the screaming from his basement to a horror movie, blonde baker invites him over to watch "Drag Me to Hell" (Loved his response that, actually, he was trying to avoid that.) With her horror movie gambit having failed, she asks him to come over some time and look at her wood chipper, which has stopped working. It's obvious she was a crush on Bobby, not that he has time for such things because his phone his ringing again. The law goes poking around in his yard to look for the body, which--luckily--is gone. Or, not so luckily, if you're Bobby's neighbor who lives alone. When he bursts into her house with a gun late at night to save her, he asks if she's seen anything strange. "Besides you?" But she quickly sees that she's in danger and Bobby gets into combat with the Japanese demon, who ends up going through the wood-chipper. Which, ew, ew, ew, but the scene was actually pretty well done and inappropriately funny...and also a bit sad. "I thought you said it wasn't working," Bobby says of the wood chipper, clearly at a loss for how to explain everything. Pan to neighbor in her white nightgown, absolutely covered in blood. "I only said that to get you over here." Bobby, belatedly realizing that she likes him, offers to come back over some time, which she rejects, looking now appalled by him. "Story of my life," he says. Awwwwww. The episode comes full circle. We once again find Bobby and Crowley in a stand-off over Bobby's soul, only this time Bobby has an ace up his sleeve (which reminds me--LOL at the playing of the Gambler earlier. It was such a change from Sam and Dean's usual AC/DC or other classic rock that it helped set a definite tone for a different type of episode.) Anyway, the boys are now in Scotland ("We've gone international. "), poising in the graveyard over Crowley's bones. Turns out, that mysterious bag earlier in the ep? Held the demoness's bones, and you kill a crossroad demon by burning their mortal remains. I loved Bobby's scathing comment to Crowley that demons think they're all that, but really they're just "ghosts with ego." Crowley is clearly pissed, but also clearly has no choice. Bobby gets his soul back and gets to keep use of his legs (yay!!!) Afterward, there's a phone call between Bobby and the boys that I loved not just because of the gruff affection between the three of them but because the teasing between the boys (Sam's smirking that Dean "white-knuckled his way through four puke bags" on the plane) seemed like the most natural, brotherly interaction they've had so far this season. Of course, this is Supernatural, so instead of just ending it when Bobby got off the phone with a sheepish, "Let's roll credits on this chick flick," they had to go just a minute further. We see Bobby try to sit down with his ginger peach cobbler (again) only to be interrupted by the phones (again!) and realize that when you're trying to save the world on a daily basis, your work is never done. And that no matter how many hunters are in his life--and who genuinely care about him--at the end of the day, Bobby Singer is still alone. Awwww! And then previews, which I don't even want to think about. What are they doing to my Dean???? Apparently, he becomes some kind of monster with a hunger for human flesh, so I am torn. Normally, if Jensen is on the screen, I am unable to look away. However, this is seeming like something best watched in tiny spaces between my fingers. Guess we'll know more in a week! I missed my deadline yesterday so I'm posting this awesome behind-the-scenes video of Weekend at Bobby's, Jensen's directorial debut. Not surprisingly, he's a natural who was well received by his cast and crew. Can't wait for this Friday! Supernatural had a 20% gain in viewership this week! I wonder if it was those delicious previews of Sam, which is the only part I've watched a second time because the rest? GROSS! 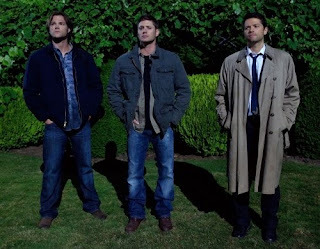 Even Entertainment Weekly mentioned that Supernatural is one of the winners in the ratings game, giving The CW its best Friday night ratings. In other news, Misha Collins is a new daddy! He and his wife have been together since high school. Isn't that sweet? The link has a perfectly adorable picture of Misha. The trailer for the Supernatural anime is out. It looks completely cool! Jim Beaver has been tweeting about being on a non-supernatural show called Love Bites. With the latest vampire craze, you'd think they'd name it something else. Okay, I have one word for the first scene in this week's episode -- Gross! Cop #1 starts bleeding, starts shedding skin, and then explodes into puddle of blood. Dude, I'm glad I wasn't eating dinner while watching this episode. May I just say again, gross! Next scene -- we've got some hot Dean/Lisa action. Only I knew from the fuzzy light that it wasn't real. Dean wakes up in the Impala. Then we have what may be one of the most rewound, re-watched scenes ever in Supernatural history -- Sam working out shirtless. I think MJ's reaction was, "Please never make Sam wear a shirt again!" And we get more evidence that post-Hell Sam is not the same as Sam pre-Hell. Mysterious girl he obviously spent the night with (and from her comments, he pleasured well) emerges from bedroom, and he pays her. No, Sammy! Not a prostitute! She gives him her number, but he tosses it in the garbage as soon as she leaves. Part of me thinks something is really wonky with Sam, and part of me thinks this isn't Sam at all, that the real Sam is still in the Cage. And that makes me sad. I was happy to see the return of snarky Dean. When he gets off the phone with Sam, he looks at the phone and says, "Who died and made you boss?" There's something about that line that makes me wonder about the identity of "Sam." Next we have a shot of not exactly the world's best cop, some yokel who is sitting in the woods drinking alcohol from a pseudo-Big Gulp cup and not making the effort to catch a speeder because he's only blowing by at 70 mph. "You can do better than that." Within moments, he has bit it from another Egyptian plague, boils. More eew! When Dean arrives in Easter, Pennsylvania, where Sam is waiting and the cops are being offed in icky ways, Dean is on the phone being all dad-like with Ben, telling him to "be a man" and tell his mom he broke something. I really am liking how we're seeing this "normal" side of Dean, but it really makes the changes in Sam stand out that much more. Sam: "Wow, you, molding the minds of tomorrow. Who knew?" Anyone remember when Sam got nervous posing as federal agents with fake names? Yeah, those days are gone. More of the old Dean comes out when he calls the killed cops "Skidmark" and "Bubblewrap." Eew, but funny. Just when I think Sam isn't Sam, something funny and very brother-like happens, like the "car wars". I laughed when Dean raced Sam because he wants to prove the Impala is better, and laughed again when they got out of their cars and shut the doors at the same time. They've arrived at the home of Officer Colfax (aka "Skidmark's" partner, who witnessed his really gross demise). He's acting odd, scratching out the faces on all the photos in his home and scratching his head a lot. He reveals that he and the two dead cops were the responding officers on a traffic stop where they shot and killed a young African-American man, Christopher Birch, for no reason other than maybe they were bigots. Ready for another plague? Yep, good ol' Officer Colfax keels over and Sam removes the guy's uniform cap to reveal...locusts crawling out of a hole in his head. I'm wondering if Tanya is watching with her fingers over her eyes at this point. I'm in danger of doing the same. Okay, so they've all been through the Apocalypse (they and Buffy should compare notes), so what Big Bad come compare? A civil war in Heaven, you say? Ding, ding, ding. You're a winner! Evidently, chaos is all the rage in Heaven post-Apocalypse, and several powerful weapons were stolen, among them the Staff of Moses, which is evidently what's causing all the icky cop demises. Cas asks for the boys' help and then utters one of my favorite Cas lines ever, complete with air quotes: "Sam, Dean, my 'people skills' are a little 'rusty'. Pardon me, but I've spent the last 'year' as a multi-dimensional wavelength of celestial intent." Misha's delivery is awesome. They go to the home of Christopher Birch's father, thinking he killed the cops, but then Chris's little brother, Aaron, points a sawed-off part of Moses' staff at them and tells them he did it, that he bought the staff from an angel for the price of his soul. Huh? Angels acting like crossroads demons? Things really are frakked up. Cas can find out who the angel is by searching for a mark inside the boy, though it will be excruciating for Aaron. Dean isn't happy with Cas, but he's more bothered by Sam's seeming lack of caring about what Aaron is experiencing, his "the ends justifies the means" attitude. The look that Sam gives Dean is so pre-Hell Sam that I'm back to thinking it's really him. Man, I want to know what's going on here. Cas reveals that the civil war in Heaven is pitting Raphael and his followers (who want to put the Apocalypse back on) against Castiel and his friends (who don't). Cas, looking for ingredients to do some spell to find Balthazar: "I need myrrh." Simple line, awesome delivery by Misha. He finds Balthazar, and he and boys go to his house. Balthazar, who has a new vessel, is digging living a hedonistic life hiding out from Raphael. He's the one who stole the weapons from Heaven. When Raphael and two buddies show up, Balthazar says, "That's my cue. Tell Raphael to bite me." Some angel toasting ensues, Cas and Raphael fight until Balthazar returns and uses a piece of the pillar of salt that killed Lot's wife to turn Raphael to salt. Of course, he'll have a new vessel soon, but this gives the rest of them a head start. Cas lets Balthazar go, saying his debt to him is paid. We get one of those "brothers by the car" moments at the end of the episode. Dean asks if Sam is okay, Sam assures him he is despite his trip to Hell. Dean says, "I feel like I'm not getting the whole scoop." You and me both, buddy. We also get a glimpse at some future episodes -- Bobby talking to Rufus about the weird way the monsters are acting, more tense moments between the brothers, and a bit of a Twilight dig when the boys are in what appears to be a teenager's room with movie vampires styled like Edward Cullen on posters. Dean: "These aren't vampires. These are douchebags." Even though I'm a Twilight fan, I thought that was funny. One last thought -- I was glad to have a Campbell-free episode. I really don't like that bunch. Last week, MJ asked the question of season six, namely what's up with the Campbells? A tie-in question, and one perhaps far more important, is what's up with Sam? After two episodes, I have to admit, I'm not sure. In the first episode, he was—as we said over and over LOL—cold and smug and dismissive and not at all like our Sammy. In the second episode, he was more on his own, and less weird. He and Dean interacted a little more normally. In fact, when faced with something he couldn't handle, he automatically looked up to his big brother for help. And Dean, of course, leaped right in (okay, after some resistance). Why would Sam join them instead of hunting on his own? I can actually think of some reasons for this. On the one hand, he was on his own for six months when the Trickster made him think Dean was dead, and again when Dean was in Hell, and you'd think he'd prefer it that way. On the other hand, all his other hunting experience—a lifetime of it—has been with someone else. Dad, and Dean, and Ruby. He may hate being alone now, especially after he decided to leave Dean alone, and welcomed companionship, people who are "like him." And supposed family to boot. He was trying to fill the void. Why would the Campbells want Sam along? So maybe we can buy why Sam wants to be with the Campbells, but why would they want him? Those people who claim to be cousins are too young to have known Samuel/Grandpa before YED killed him. If they'd been raised in the life, why would they suddenly follow him? Hunters are loners for the most part, that's well established. Whoops, I'm delving too far back into the damned Campbells question. Back to Sam, who freed Lucifer and came back from the cage. Why wouldn't they assume he was still possessed or something and try to kill him? Why wouldn't they hate him for unleashing so much onto the world and making their jobs and lives harder? Why did Sam reveal himself to Dean? If Sam truly thought Dean was better off thinking him dead and staying out of the life, he could have stayed that way. He could have killed the djinn, rescued Dean, and hidden or left so Dean never knew he was there. Or he could have sent Bobby to protect Dean and Lisa and Ben, or even just the Campbells. Yeah, Dean would have found out sooner or later, but there were ways Sam could have achieved his stated ends without revealing himself to Dean. This is the biggest, most disturbing question. I want it to not be Sam. I mean, the smugness during the hug was too reminiscent of Lucifer. I don't want him to just be changed by his possession or his time in the cage or his new life. Change is inevitable, and I don't mind it—but I don't want him to change like this. If it's not Sam, who could it be? If it's really Sam, what else could be going on? My favorite theory is that he's either under the Campbells' thumb somehow, or suspicious of them and scared so that he needs his brother. His oddness would be because of that fear, and the agenda he's trying to hide. But I'm sure there are a bunch of other things that could be going on. What's your favorite theory? Cozy fire, fam pics, blood-smeared hand smashes framed photo. A bloody mom carrying her baby runs through the house. Phone’s dead. They hide under the bed. Damn, don't do that. They always find you under there. Footsteps. Bad guy goes away. False security. Mom see’s her dead husband. She squeals, but killer seems not to have heard. Then she’s yanked out from under the bed. Totes saw that coming! Dean checking weapons in the Impala. Puts them away and covers the car back up with a tarp. Boo. Wow, he’s moved Lisa and Ben into a new house. The poor kid isn’t happy about it. 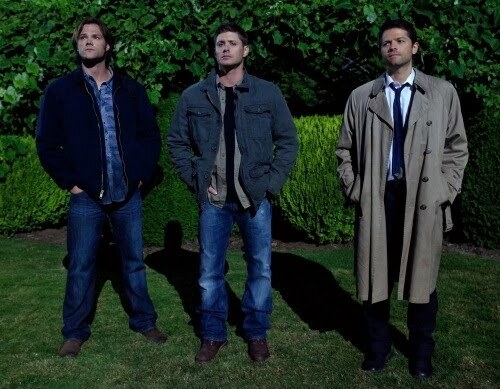 Dean is reluctant to let either one of them out of his sight. Sam talks to cops about missing baby and murdered parents. Dean orders pizza instead of taking his family out. Lisa and Ben are upset he’s keeping them under house arrest. Sam discovers there was no sulfur. No EMF. But four couples have been killed and four babies are missing. Grandpa Campbell’s on the phone saying this isn’t natural. Sam realizes there may be one common connection--Harper Caine Home Security. Dean catches Ben playing with a rifle from the Impala and he’s very upset. He snaps at Ben and says he’ll never, ever shoot a gun. Ben is crushed by Dean’s outburst. Clients of Harper Caine definitely seem to be the target. Sam goes to find a client that’s still alive. Lisa is freaked by Dean’s overprotective attitude and tries to convince him they have to live life, despite nameless threats. Sam breaks into a house and finds the parents dead. He follows some bloody footprints and is, of course, attacked. Sam cuts the Caine security guard with a knife and the silver burns him like acid. The dude disappears and Sam finds something—I’m guessing a baby— under a table. Sam calls Dean for help. Dean is salting the windows in his new house and says he’s out. Sam threatens to stop by his house if he doesn’t meet him. Dean shows up. Cue the creepy music and then flash to Dean seeing…an adorable, big-eyed baby in the backseat. Dean instructs Lisa on the proper way to load and use a gun, while she encourages him to go handle this mission with his brother. He does, but shows up in his truck! Why? Where’s the Impala? The brothers figure they’ve either got a ghoul, zombie, shifter or any other dozen of things on their hands. Only problem is, none of them typically babynap. The Winchester boys go shopping for baby supplies! Dean’s not entirely clueless thanks to Lisa’s niece. The baby starts crying and neither of the guys can figure out how to make him stop. I keep yelling at Dean to “pick him up!” Their awkwardness is adorable and funny. Especially when Dean cries back at the baby. I’ll admit I’ve used that approach myself. Didn’t work any better. A nice woman in the grocery line holds the baby, who they’ve dubbed Bobby John (love that!) and finds he’s a bit wet. Dean’s relief at having help turns to fear when he sees her on a security feed. Her eyes are flashy. He demands the baby back and she takes off with the infant. Dean tries to grab her and rips off some of her skin. (Eeew!) In a nice move, Sam intercepts the baby. Dean then catches the woman and tries to stab her, but she cries out like a victimized old woman being attacked by a hoodlum and a store manager comes to help. The Winchesters run off with the baby. The evil woman takes notes of Sam’s license plate. After changing Bobby John’s diaper, Dean sings to the baby (Smoke on the Water!) and gets him to sleep. Sigh. There is nothing sexier than a man cuddling a baby. So hot! Sam compliments Dean on his parenting skills. Dean says he’s had some practice with Ben. He considers the kid his and he wants something more for him then what their dad gave them. Sam points out Dean's holding them prisoner, just as they were. Sam leaves to find a different baby’s father. He realizes a shifter posed as the guy and slept with his wife, getting her pregnant. Dean is enjoying his usual magic fingers when the baby starts screaming. Blood and goop explode everywhere. Naaasty! The baby’s a shifter and he just went from white to black. Hee hee. Knock on the door. Guy says there have been complaints about the crying baby and can he please come in. Dean refuses. Guy breaks in. It’s a shifter and he says the baby should be with his father and then he intimates there’s a greater father the baby belongs to. Say what??? The boys ascertain the shifter posed as a security guard for Caine. He scoped out families and when the dad left on business he would pose as the husband, get a little nookie and then goes back 9 months later for the baby. Clever, but oh so gross. Sam calls Bobby John a baby monster. Dean wants to protect him. Sam suggests bringing it to Samuel, but Dean hates the idea. Anyone else notice how Sam is dehumanizing things? He calls the baby and Ben by him or it. Dean won't hand Bobby John over. Who could blame him. And have I said how HOT Dean looks with a baby? Sam takes Bobby John and hands him over to Samuel. Samuel says they're going to raise him. Dean makes his distrust known. Especially after it's decided that Christian will be the baby’s daddy. Seriously, what is this? Does anyone else think maybe they’re collectors more than hunters? Dogs start barking. The Campbells tell the Winchesters to put the baby downstairs in the panic room where he’ll be safe. The shapeshifter shows up as Samuel. They shoot him, stab him, and tranquilize him. Dude does not go down. He kills one of the Campbells and shakes off the sedation. The shifter shows up in the panic room as Sam. Then he turns into Dean. Dean starts to strangle Dean and then takes the baby. Real Dean passes out. Faux Dean struts off with the baby. Turns out that was the Alpha, the king shape shifter. The first shifter to spawn all the others. Samuel doesn’t know if it’s possible to kill the Alpha. Dean accuses Sam of using the baby as bait to catch the Alpha shifter. Even he doesn’t trust his brother! Samuel is talking to someone on the phone, promising he’ll catch the Alpha. Dean returns home to Lisa. He’s so torn. Poor baby! Is it better to stay with them and keep them safe, or is it better for them if he goes? Lisa doesn’t know if they’ll be safer one way or the other, but she knows he’s a hunter, not a construction worker. She knows he wants to be out there, with Sam. And she understands. God love her. An SPN woman besides Pamela, I actually like. Lisa knows Dean will keep having this internal struggle and she thinks he should go. Dean is shocked she doesn’t want him. She says that’s not the case. He can go do what he needs to and come back to her when he can. Just as long as he comes back in one piece. Dean doesn’t know if they can pull something like that off, but she says it’s worth a shot. Awwww. Final shot…Yay! The Metallicar is unveiled and brings a smile to Dean’s face. He’s back! And that is SUCH an incomplete episode. Sheesh. I hate it when so many things are left unresolved in an episode. And next week’s preview— which included a, GODHELPME I watched it over and over again, in slo-mo, shot of Jared doing pull-ups with his shirt off—doesn’t look to address the shifter thing. Where’s the poor monster baby? Who’s grandpa talking to? Are they starting a zoo of Alpha creatures? Was anyone sad the one Campbell died? Didn't see a bit of mourning. Sam seemed a little more himself, but even he admitted something’s off. What is it? All in all I had mixed feelings about this episode. Loved the humor, glad to see both guys a little more themselves, adored seeing Dean with that baby (sigh), but I’m annoyed by the Campbells and whatever the heck is going on. Maybe Cass will shed some light next week. What did you all think?